The star of a film about a troubled young Glasgow mum who dreams of being a country singer says the city has "stolen [her] heart". Irish actress and singer Jessie Buckley plays Rose-Lynn Harlan. She said that of all the places the film has been shown its Scottish premiere at the Glasgow Film Festival was the most important. After the premiere and a Q&A, Ms Buckley performed at Govan's Grand Ole Opry, where much of the film is set. Much of Wild Rose was filmed in the city, with its star saying she hopes she has done Glasgow proud. 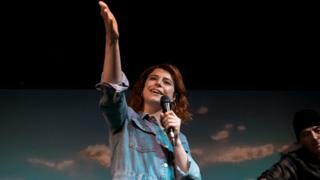 Jessie Buckley said of the city: "It's stolen my heart and danced it around. "Anytime I come back to the city I'm like 'Yeah, I'm back!'." She added: "Of all the places we've shown it, this means the most and I hope we've done them proud." Glasgow City Council claims their Glasgow Film Office brought £19.1m to the city's economy in 2018. It said this was a 26% increase on the previous year. Since its creation in 1997, its remit has been to promote Glasgow as a "film-friendly" city. According to the council, it has helped brought productions to the city that have generated more than £320m for the area. Recent productions to film in the city include Outlaw King, The Wife, Still Game, Outlander, The Replacement, Shetland, Trainspotting 2, Churchill and Fast & Furious 6. BBC Scotland recently reported that a film produced by Steven Spielberg has asked to film in the city. The World War One drama 1917, directed by Sam Mendes, will film in the city's A-listed Govan Graving Docks. It was filmed in locations across Glasgow, including Maryhill, the Old Fruitmarket and the Grand Ole Opry. The film was written by Scot Nicole Taylor, she said: "I'm from Glasgow, I love country music. I was always going to write about those two things." She added that she was "terrified" but "excited" about the showing. It will be released in UK cinemas on 12 April.